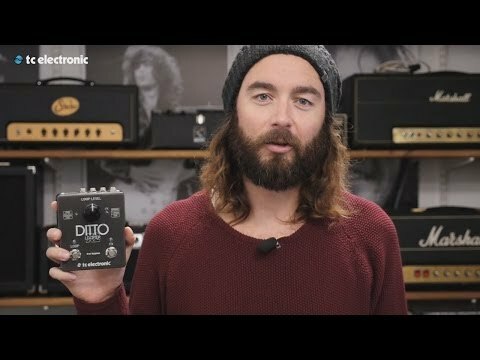 Compact guitar pedal effect – looper that is an improved version of the first Ditto looper, very intuitive and was designed by guitarists for guitarists, and provides extra features such as dedicated Clear/Stop button and Looper effects – Stop, Reverse and Half Speed. It also provides stereo input and output and supports import and export of loops from PC/Mac in 16-24-bit/44.1 kHz resolution, and offers an Undo/Redo function, and Backing Track function, perfect for solo practice and live performance. Looper provides 5 minutes of looping time and unlimited overdubs, and has ultra-small footprint and fits any pedal board. It also allows the “dry sound” to pass without ever converting digital and keeping the original tone with zero latency via Analog-Dry-Through, as well as bypassing. This product requires 9 V DC adapter that is sold separately. Dimensions: 113 x 135 x 54 mm. Weight: 512 g.
Do you own TC Electronic Ditto X2 Looper or have you had a chance to try it? Speckó ár alapján megfelelő, a felhasználhatósága kifogástalan. A dedikált stop funkció miatt könnyedén lehet játszani vele. Ha looperben gondolkodsz, szerintem ez az a darab, amit gondolkodás nélkül rendelhetsz. + Super hračka na cvičení i zábavu. Robustní zpracování. Intuitivní ovládání. Napájení i na baterie 2x 9V - Absence návodu v češtině. Maximalna spokojnost. Urcite lepsi ako jehi nano verzia. Ak uvazujete o looperi, urcite si najdite taky, ktory ma dedikovany STOP footswitch a moznost mixu.